IlTuoSpazioWeb Review 2019: Is IlTuoSpazioWeb a Good Hosting? IlTuoSpazioWeb is an Italian web hosting company with data centers in the U.K., and U.S. It offers shared hosting plans powered by renewable energy and backed with 24/7 customer support. Italian company, IlTuoSpazioWeb is a comprehensive web hosting provider with data centers in the U.K. and U.S. It provides round-the-clock support for basic shared, LightSpeed cached, and semi-dedicated hosting plans. IlTuoSpazioWeb proudly uses renewable wind-derived energy in its data centers. The website is available in Italian. Usability is important for most web hosting customers and IlTuoSpazioWeb provides this with easy auto-installation of scripts such as WordPress or other CMS platforms. The cPanel control panel allows for immediate access and control over your website upon activation of your hosting plan. Auto-installing software such as WordPress allows you to get right to creating your personal or business website without time spent messing around in the backend. Another helpful feature is the free SSL Let’s Encrypt certificate. Let’s Encrypt is a free, secure, and open-source tool for providing website owners with digital SSL certificates in order to obtain HTTPS. HTTPS is basically the secure version of the HTTP protocol we’ve been familiar with for years. Adding Secure Sockets Layer (SSL) adds a layer of encryption to your data, and Google will respond to your website having a Secure Sockets Layer (SSL) certificate by showing your website as secure. You may also see a small boost in your search ranking because of this. Pricing for this company’s hosting plans is very reasonable and competitive. Compared to other top Italian or European web hosts, they are priced right amidst their competitors in the more affordable tier of providers. The entry plan starts around the price of a cappuccino and all plans can be paid monthly, every six months, annually, or longer, with discounts of around 20% given with longer term agreements. IlTuoSpazioWeb also offers a 30-day money-back guarantee with their hosting plans. If something isn’t working out for you, simply cancel and get your money back. Customer support is provided through telephone, live chat, and support ticket. 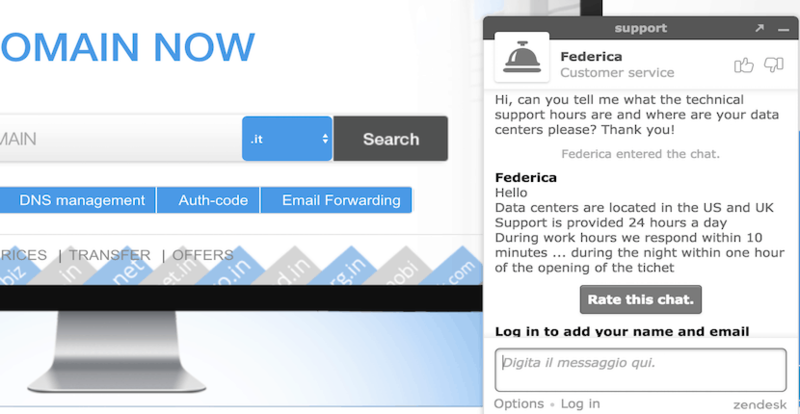 IlTuoSpazioWeb proudly claims to provide service to its customers with a personalized touch and I found the live chat support to be very fast, knowledgeable, and courteous. Having fast and helpful customer support is a great sign of a web host that prioritizes the customer experience. If you’re looking for a competent Italian web hosting provider, IlTuoSpazioWeb is a worthy candidate. It offers affordably priced shared hosting plans along with 24/7 support and an array of standard performance and security features. Add to this the dedication to renewable-sourced energy, and you have a very decent hosting option. Wondering how IlTuoSpazioWeb stacks up against other Web Hosting companies? Enter any other Web Hosting company and we will give you a side-by-side comparison.